ABSTRACT: Jon Karafin, CEO of Light Field Lab, Inc., will detail the very latest developments in light field and holographic display technologies including insights into the creative and technical implications for content creation, as well analyze the data requirements and solutions for streaming holographic media, and provide a glimpse into Light Field Lab’s holographic technologies. 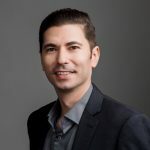 Speaker: Jon Karafin, CEO and Founder, Light Field Lab, Inc.
Bio: Jon Karafin has dedicated his career to innovation in live action cinema, VFX post-production, and light field technology- transforming bleeding-edge concepts into market ready solutions. As CEO of Light Field Lab, he applies this expertise to the development of a next-generation holographic technology. Karafin has an extensive background in light field and visual effects technology, having previously held executive roles at Lytro, RealD and Digital Domain. During his tenure, he was responsible for ushering in a new era of cinematic capture through the launch of Lytro Cinema, as well as delivering technology and content for many of the all-time highest grossing feature films, including Peter Jackson’s The Hobbit, Michael Bay’s Transformers 3, and Tim Burton’s Alice in Wonderland. Karafin holds multiple graduate degrees from the Rochester Institute of Technology (RIT), as well as BFAs in multiple fields from Ithaca College.